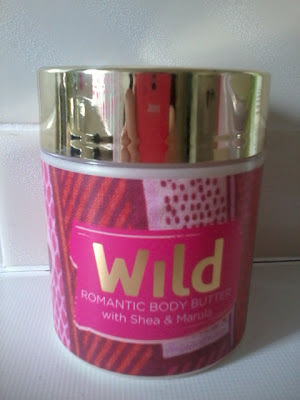 A while back I was lucky enough to win a tub of Wild Romantic Body Butter with Shea & Marula. Wild products are fair trade and free from parabens and SLS. The range is made with the highest quality of natural ingredients sourced from Africa to create a unique collection of body butters and soaps. Wild Romantic Body Butter with Shea & Marula is fragrance with Ylang Ylang, Lavender and Patchouli. It is a strong aroma and I have a bit of a love hate relationship with it depending on my mood. It is unusual and at times I feel it is a feminine fragrance but at other times I would describe it as masculine. I had my Mum give the product a sniff just to check I wasn't going bonkers and she did agree with me. The texture of the cream is luxurious and similar to whipped shea butter. It is not solid in the tub making it easy to scoop out and apply to the skin. Since the fragrance is strong for my taste I mainly use it on my legs. You all know I love shea butter and this is no exception. It does not irritate after shaving and helps combat dryness. I recommend you have a look at the rest of the range as the fragrances are very different to other shea butters I have tried. If you are concerned with irritation from essential oils then perhaps the Sensitive Body Butter with Aloe & Avocado may be the better choice for you. Overall this is a lovely product and a pleasure to use. A 170ml tub costs £15.50 (a little goes a long way) and can be purchase direct from the website. Disclaimer - this was a competition prize via Twitter & I was not obligated to review the product.